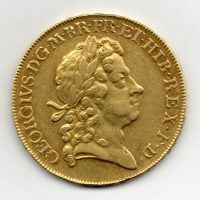 1726 Five Guinea, George I laureate head, reverse, crowned cruciform shields, sceptres in angles, D.TERTIO on edge, S.3626. 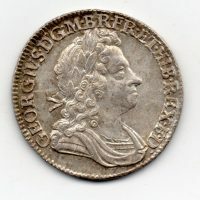 1723 Shilling, George I laureate head, reverse, crowned cruciform shields, SSC in angles, virtually uncirculated, toned. 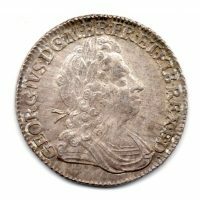 1723 Shilling, George I first bust, reverse, crowned cruciform shields SSC in angles, slabbed by NGC MS 63. This is a beautiful example of this early shilling.